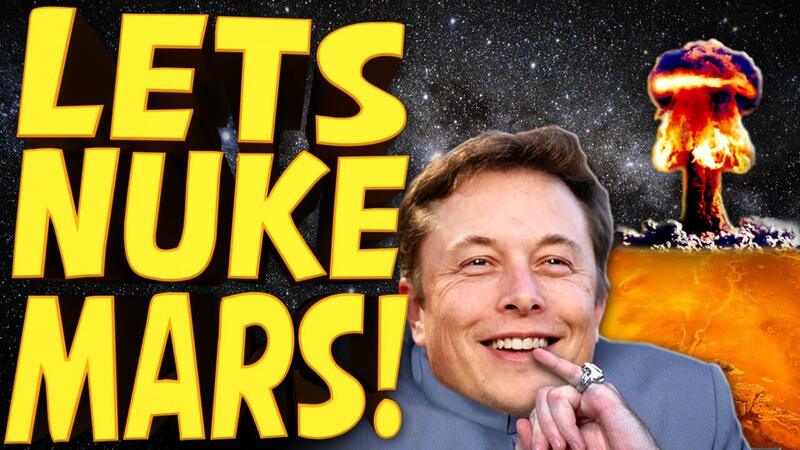 On Wednesday night, SpaceX and Tesla founder Elon Musk appeared on The Late Show with Stephen Colbert and announced that the speediest way to terraform Mars and allow humans to live outside of an airlock dome would be to nuke it. “The fast way is to drop thermonuclear weapons over the poles,” Musk told Colbert, prompting the host to call him a super villain. But is the idea that crazy? The basis of the bomb plot is that the nukes would melt the frozen CO2 on the Red Planet’s poles, releasing it as gas into the atmosphere. This would help to thicken up the Red Planet’s thin atmosphere, which could be enough to heat the planet and allow water to exist in a liquid form. Essentially, the bombs would kick-start something similar to the global warming that’s happening here on Earth, and hopefully trigger a cascade effect – so the more ice that melts, the more CO2 that’s released, which warms the planet and melts more ice, and so on. However, there are some obvious downsides to this plot. Not least of all the fact that those bombs would also release a whole lot of radiation that may or may not contaminate the Red Planet. The bigger problem is the fact that they simply wouldn’t make that much of a difference, Samantha Masunaga reports for The LA Times. Toon also explained that the amount of CO2 already present in Mars’s atmosphere is already incredibly high, and while adding to it may make the planet plant-friendly, the atmosphere wouldn’t be suitable for animals anyway. But in good news, Musk also used the interview to announce that SpaceX would be sending humans into space in the next two or three years, and there’s a good change they’ll be riding there in this beauty. Let’s file that one under transportation goals.